My aunt gave me some salt-brined raw mangoes (Uppu Maanga) from Kerala and I was happy. Unripe, tender Mangoes are preserved in Kerala by brining it in salt solution. Well-brined Mangoes stay unspoiled for over a year. These brined, green Mangoes can be used for making Curries, Pickles and Condiments. My mom often makes pickles with Uppu Maanga. I have fond memories associated with Uppu Manga. Whole Green Mangoes or cut mangoes immersed in a salt solution would be stored away safely in a Bharani (Ceramic Jar) for later use. The thought of Kanji served with crushed Uppu Manga makes me drool. 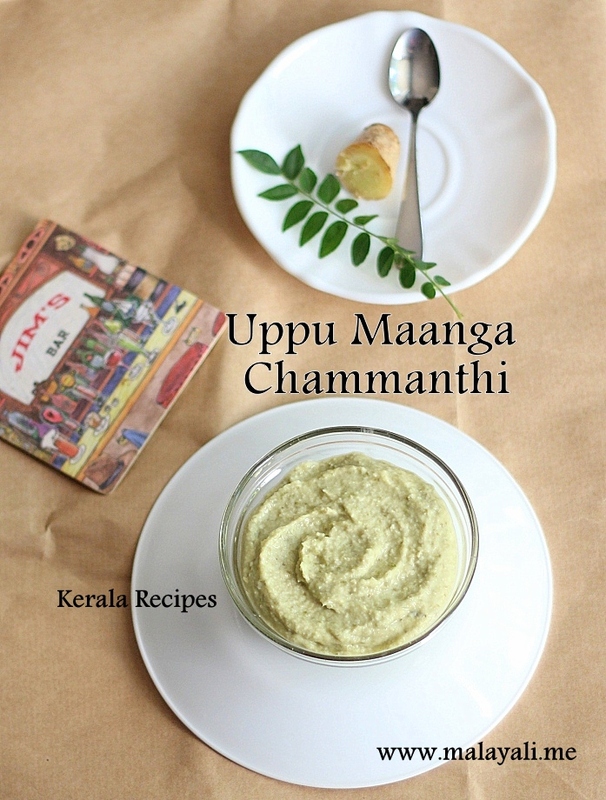 Here is the recipe for Uppu Manga Chammanti (Brined Mango Coconut Chutney). Chammanthi is usually a thick paste made by grinding coconut with other ingredients. Since brined mangoes retain lot of water, this Chammanthi wasn’t as thick as the other Chammanthis. Uppu Manga Chammanthi makes a wonderful accompaniment to Rice or serve it with Kanji. Blend everything together in a mixie or food processor until you get a coarse paste. Add salt only if required. 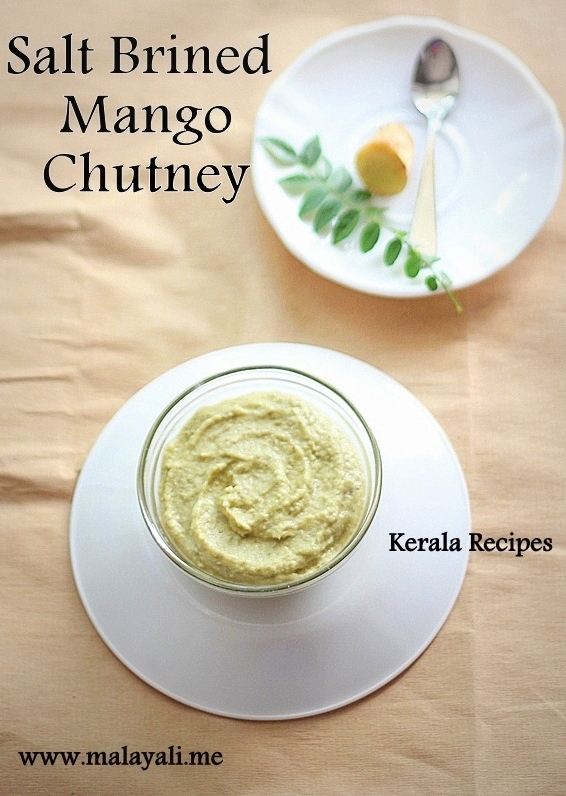 If you don’t have brined mangoes, you can make Chammanthi with sour, green mangoes. Hi Jisha. My name is Prathima and I just wanted to say thanks for this recipe. My mom made this for Onam Sadhya and it tasted really yummy with rice. Please give me your e-mail address so that I can e-mail you a photo of the chutney. Thanks.